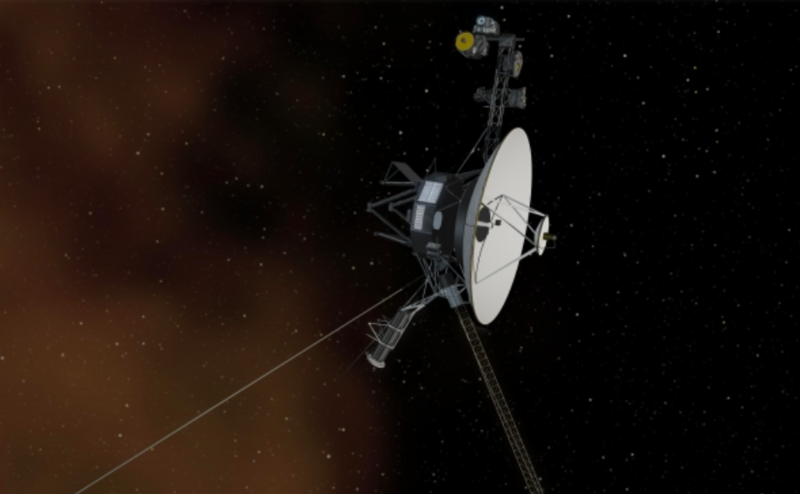 This August and September mark NASA’s spacecrafts Voyager 1 and 2’s 40 years of exploring space. They have boldly gone where no man or man-made object has gone before. 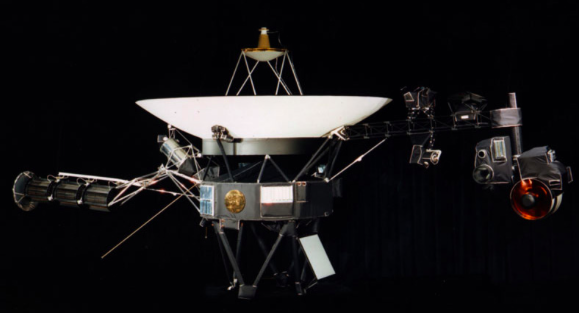 Both Voyagers left Earth in 1977. Their lifespan was expected to be five years, but 40 years later, they are still going strong! They still send daily messages to Earth. Voyager 1 is now almost 13 billion miles from Earth. It left our solar system and is travelling northward through “interstellar space”. It has been zooming at a speed of about 38,000 miles per hour (60,000 km/h). It takes over 19 hours for a signal from Voyager 1 to reach one of the antennas here on Earth. Interstellar space is the space between stars where the effects of the stars are not felt. 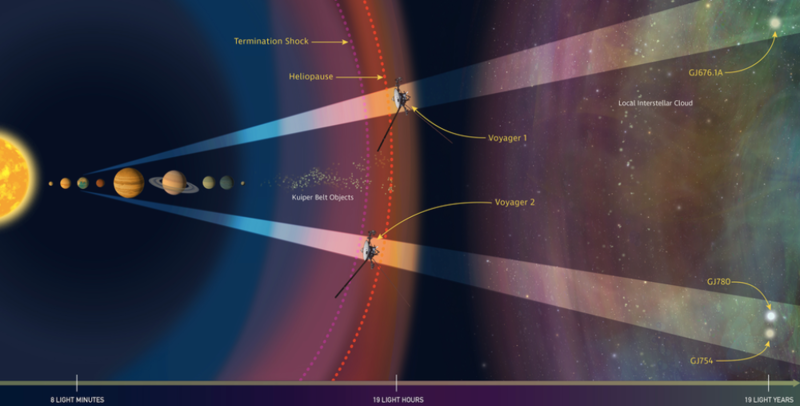 Voyager 2 is now almost 11 billion miles from Earth. It is traveling southward, and has a few years before it reaches interstellar space. It is the only spacecraft to have flown by the four planets – Jupiter, Saturn, Uranus and Neptune. It has been zooming at a speed of about 34,000 miles per hour (55,000 km/h). It takes about 16 hours for a signal from Voyager 2 to reach one of the antennas here on Earth. There is a time capsule with information about human beings on both the Voyagers. 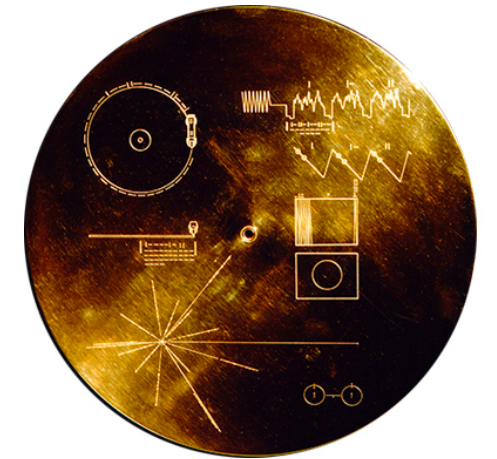 The capsule has a 12 inch gold-plated phonograph record with images that portray people and life on Earth, natural sounds of birds, music from several countries, and greetings in various languages. 2017 also marks 60 years since the first artificial satellite was launched by humans into space to orbit Earth. Sputnik I was launched by the Soviet Union on October 4, 1957. You can watch a video here about the two Voyagers and another video about how far humans have sent spacecrafts into space. “To boldly go where no man has gone before” is a quote from Star Trek television episodes and films.